A scream rang out—he’s got a gun! It was a nothing can go wrong kind of bright, sunny day. Meeting her best friend Antonia Gazelle for coffee on a Saturday morning was a chance for Mindy Murphy to catch up, relax, and regroup, her mood joyful. On the way to the café, the flat, uninhabited land dotted periodically with ancient windmills reminded Mindy why she loved living in the desert. The deep blue, cloudless sky reached to the horizon with nothing to interrupt the vista. The chaparral was in bloom as far as the eye could see, and although it wreaked havoc with her allergies, the fragrance was heady and intoxicating, inviting deep breaths, which she’d later regret. Her honey-blond hair, gathered in a ponytail on top of her head, blew in the wind, with the top down on her vintage Mustang convertible, taking advantage of the last days before air-conditioning would be mandatory around the clock. When she arrived at Baker’s Bakery and Coffee Shop, the large EAT sign with a flashing arrow unnecessarily pointing to the entrance, Antonia was already there, smiling, glad to see her old friend. They’d gone from kindergarten thru twelfth grade together, and after graduation, their lives diverged, with Antonia going away to college and veterinary school in San Diego, and Mindy working full time on her grandfather Henry Murphy’s Shadow Valley horse ranch. As different as night and day, in their youth they were called the multiracial twins because they were always together. Antonia was dark and voluptuous with fiery eyes that bored a hole through you. Always seeming to be in motion, Antonia’s vivacious personality just drew men to her, and she had a steady stream of suitors who all fell in love. Shy Mindy was the same height, but slender, with blond hair and blue eyes set in an oval face, and skin that burned without tons of sunscreen. Because of disappointments and probably some fear as well, she rarely dated, and the older she got, the less desire she had to try to meet anyone. Content being alone, her passion was the ranch and the horses they cared for. She put her hands on her hips and posed from left to right. Mindy giggled, the joke being Antonia’s breasts were often in danger of spilling out of her clothing, no matter how modestly she was dressed. In that jovial frame of mind, they entered the café, and the first person Mindy saw sitting near the door was a neighboring rancher, Fred Rough, or Miserable Fred as he was called behind his back, smirking when he saw the girls. Older than middle-aged, Fred still had the ambition of a younger man, with the wisdom and confidence of someone who had pulled a few tricks in his life. “Hi, Mr. Rough,” Mindy said respectfully, her poker face in place. “You can call me Fred. Old Henry finally let you have a day off,” he said, grinning up at her, his hat still on his head even though they were inside. “Enjoy your breakfast,” she replied, ignoring his comment. Antonia worked for the state of California as a livestock inspector. Her comment shut Fred up, the history between them toxic and getting worse due to his failure to follow the rules the state had in place for the documentation of the animals he boarded on his ranch. Dismissing him, she flipped her hair and kept walking. A favorite booth of patrons was halfway between the back of the café and the front door, and luckily, it was empty. They slid in across from each other, talking in hushed tones about despicable Fred. There was dissension between Fred and Mindy’s grandfather, Henry, and some of the other ranchers. The Bureau of Land Management contracted Fred’s ranch as a long-term holding facility for captured wild horses until they could be adopted or go to auction worse possibly to slaughter buyers. Keeping the lot open so he could collect his money from the government was a priority, and every time Antonia showed up at his place, the threat that she might shut him down made his animosity for her increase. She was constantly poking around, asking to see paperwork, taking pictures with her phone of documents—all things Fred and his brother, Bruno, had to comply with. The BML is the watchdog of the wild horses that live on federal lands. One issue of dissension between ranchers is the way public lands are utilized. Although more land is used for livestock than for wild horse grazing, the BLM and some ranchers feel the horses are damaging the range. Fred would never lack for boarders as long as cattle ranchers had their way. They studied the menu although it hadn’t changed since they were kids. “Mindy, it’s ten in the morning,” Antonia said, frowning. They shared the gossip and news of the week. Antonia considered dating another veterinarian in her office. But he ate with his mouth open and never cleaned his glasses. “You know me, can’t keep a secret if I tried. When do you leave on the drive?” Antonia asked, changing the subject to the trail ride Mindy and her grandfather had been planning for six months. “You can’t keep me away. I’m taking my vacation up there again this year,” Antonia said. The horse drive was a tradition from generations back. The yearly journey to Shadow Valley Ranch’s summer camp in the high country had its roots in the mystical time of the wild horses of the Mojave Desert. The horses near Henry’s camp in the Kingston Wilderness were descendants of a post-Civil War horse drive across the Sierras. In the early days, Henry’s father, Mindy’s great-grandfather, had watched the wild horses carefully for any that might be sick. The horses had a natural immunity to parasites, but if they found a sick animal, they’d treat them. Rarely, they’d have to put them out of their misery. This was before the time of the Bureau of Land Management, which was founded in 1946. At one time ranchers were allowed to sell the horses they captured, but it was the Murphy family’s tradition to release them after they were treated. Occasionally, over the generations, they’d keep a horse. The modern-day trip was focused on getting their domestic herd out of the summer heat of the desert. “I can’t wait,” Mindy said, waxing fondly about the quiet and simple life they’d have, at least for the weekend. There was a break in the conversation when Antonia glanced at the counter across from their booth. She tapped Mindy on the hand. “You have an admirer,” she said, smiling. “Do you know them?” Mindy whispered. Two men sat at the counter. One was angrily talking on the phone; the other guy was staring right at Mindy. She looked into the greenest eyes she’d ever seen, his left eye almost covered by a shock of sandy hair. It was Randy Johnson, a fellow horse-lover she’d seen from afar at a bait and trap protest she’d once gone to. The protest had been held on public land bordering the edge of Fred Rough’s vast property, and Mindy knew that the horses they caught would probably end up in his long-term holding lot. Shuddering, Mindy didn’t want to think about the horrible experience of seeing the wild horses trapped. A temporary corral had been prepared with bait for the horses: green alfalfa that would be difficult to resist no matter the threat. The corral was set up over a period of days to trick the horses into feeling safe. As each horse entered the trap and the door banged shut behind them, Mindy could feel their fear and hopelessness. The confusion brought on by the trap they had just walked into segued to resignation. They would seek out others in their band for comfort when the deed was done. Finally, the last mare, with her foal by her side, entered the trap. Mindy sensed she had done so with full knowledge that her family had already been captured, and that by joining them, they would be reassured, knowing that she and her foal were still together. They made eye contact, and Mindy knew immediately she would be in trouble if she wasn’t careful. His smile was mesmerizing, and she smiled back at him for the first time—there had been nothing to smile about at the roundup where their paths had formerly crossed. He was slender but muscular, and she wondered what he’d look like with his shirt off. That uncharacteristic fantasy embarrassed her, and she knew she was flushing. “Do you want to join us?” Antonia asked, sliding over, ever the coquette. Randy slid in next to her across from Mindy, whose hands were folded on the table in front of her. She watched him move, taking in the view. “I don’t want to interrupt your breakfast,” he said just as Mindy’s pie arrived. “You’re not interrupting breakfast, at least not for Mindy,” Antonia said, laughing. “No way! I ordered pie, too,” he said, smiling. “Baker’s has the best pie,” Mindy said. There was a pause in the conversation. “So you know each other from protests?” Antonia asked, trying to get her shy friend to talk to Randy. “We’ve been at the same ones. They’re not exactly social events, so I never felt right about approaching you until now,” he answered, looking right at Mindy. It was Mindy’s turn to ask, getting the feeling they were up to something, like maybe Antonia was matchmaking. “Like I said, we’ve run into each other when I’m doing inspections,” Antonia said, keeping it vague. The waitress brought his pie and coffee over. “What kind is it?” Mindy asked. “You ordered my favorite pie,” Mindy said, giggling. They high-fived, and Antonia rolled her eyeballs at their corniness. Randy couldn’t take his eyes off Mindy. During the protests, his passion for the plight of the wild horses must have clouded his vision, because although he’d found her attractive then, sitting across from her now, he decided she was beautiful. Her blond hair streaked with honey was pulled into a ponytail, and tendrils had worked their way out of the holder, framing her face. Deep blue eyes rimmed with long lashes crinkled at the corners when she smiled. A spattering of freckles across her nose and cheeks were evidence of her life in the sun. A broad-brimmed straw hat on the seat next to her proclaimed the feeble attempt she’d made at staying out of the sun. “I think we’d better get married,” he said seriously, trying not to allow his attraction for her to be too blatant, and failing. It was just easier to tease. “We are over the hill,” Antonia said, laughing. “Twenty-six is the perfect age for a woman,” Randy said earnestly. “How do you figure?” Antonia asked, challenging him. “Oh, is that right! Well, it’s news to me,” Antonia said. They ate and talked and laughed for the next ten minutes. He had an endearing habit of holding his hands tightly in front of him so he didn’t gesture. Wanting to tell him to just go for it and talk all he wanted with his hands, Mindy wondered if someone had teased him about it. “I teach, so I’m trying not to do this,” he said, waving his hands all over, and the women laughed again. The guy Randy had been sitting with at the counter finally got off his phone and came over to their booth. “Meet Ken Crofoot,” Randy said to Mindy. Ken Crofoot was definitely another breath-taker, Mindy decided. Comparable in build to Randy, there the similarity ended. Where Randy had the clean-cut good looks of a California guy, this man was dark with shoulder-length curly black hair, which he’d tucked behind his ears, and flashing blue eyes. His hands, arms and neck were covered with tattoos, and he had on an array of beautiful silver rings and bracelets. “Nice to meet you,” he said to Mindy, smiling pleasantly. Then he grinned a big, white-tooth grin at Antonia, and Mindy noticed that her friend was actually acting demure, smiling back at Ken. Ken nodded knowingly. When he walked off toward the exit, the trio went back to talking like old friends until a scuffle up at the front of the café got their attention. Randy stood up to see what was going on, grasping the edge of the table. “Fred Rough just pulled a gun on Ken,” Randy said, debating whether he should run to his friend’s aid. Not waiting for her to react, he pushed Antonia down then reached for Mindy and shoved her under. Patrons screamed, glass breaking as shots rang out, the sound of footsteps pounding as people ran past their table. “I’ve got to see if Ken’s hurt,” he said, leaving them under the booth. They waited through the melee, and soon the sounds of sirens could be heard from the police barracks down the street. Randy ran back to them, frantic. “Are you okay?” he asked, holding out his hand. “I’m okay, but the floor under that table is disgusting,” Antonia said, letting him pull her from under the table while brushing off her jeans. “What the hell is going on?” Antonia asked, huddling with Mindy. A family with crying children ran past them to leave out the back. “Let’s get out of here,” Randy said, pale, pushing them toward the back exit. Can She Keep Secrets and Monsters at Bay? Buy Love Under Fire and Get a New Pam of Babylon Short Story, FREE! 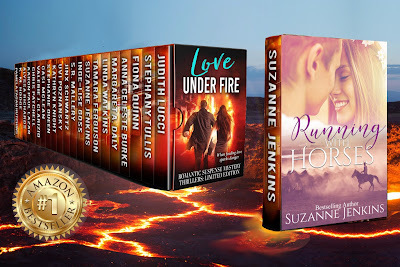 Love Under Fire on Amazon! Whoot!